STR/ AFP/ Getty ImagesNorth Korean leader Kim Jong-Un. China tried to keep Kim Jong Un’s visit to Beijing a secret earlier this week. As China banned all mention of Kim Jong Un on its internet during his secretive visit, people on the internet dodged the ban by calling him “fatty on the train” instead. 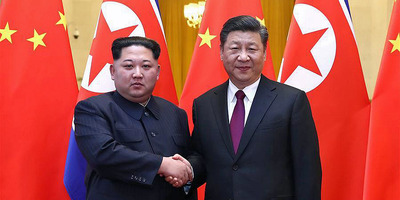 The North Korean leader made an “unofficial visit” to Beijing earlier this week, China finally announced on Wednesday. But while the visit was in progress, nobody would say what was going on, despite huge speculation and the fairly obvious signal of Kim’s personal armoured train pitching up in the city. The Chinese term they used for “fatty on the train” is 胖坐火车, which is pronounced “pang zuo huoche” in the widespread Mandarin dialect. Since the visit ended, references to Kim and North Korea have reappeared on China’s internet. Xinhua News via TwitterKim with Chinese President Xi Jinping in Beijing. China most likely knew to censor those nicknames because it had done so in the past. Beijing temporarily barred terms like “Kim the Fat,” “Kim Fat III,” and “Kim Fatty III” from the internet in late 2016, as people speculated over the North Korean leader’s weight gain.